One of the benefits of being unemployed is that you are suddenly freed up to new opportunities -- I was recently invited to accompany my mom on a 10 day trip to four cities in China and depart this week! Once I said yes (very enthusiastically) the mad preparations began. Also remember, China is a Communist country, so it also necessitates being overly cautious with how and what I bring. What's a Queen to do? Be uber-prepared and ready for anything! Here's how I do it...presenting "The FAQ Travel Checklist for food allergies, chemical and environmental allergies"
1. 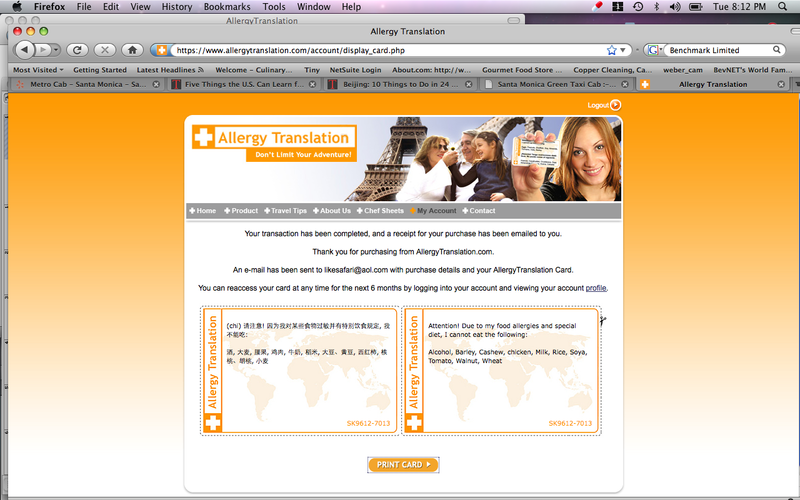 Ordered a customized Allergy Translation card with up to 10 specific allergens in Simplified Chinese. This only took only a few minutes, I got to print as many cards as I wanted, and was only $8. You have a choice to note whether your allergies are life-threatening or not. Great deal. I've attached a screenshot of the card I ordered. 2. Kept all prescription medication in the original containers with the prescription on them. 3. Updated my prescription Epi-Pen and made a copy to keep with it in my purse (it was two years overdue. Oops). 4. Packed all my natural remedies for any possible tummy troubles: papaya enzymes for digestion after every meal, activated charcoal for upset stomach, and Digestive Advantage for IBS (free 30 day trial!) probiotics every day. 5. Packed my Imodium, just in case the items in #4 fail to work! 6. A friend reminded me about the super-polluted air quality in Beijing (totally forgot that was an issue during the Olympics)! It will be worse in the winter because a lot of Chinese heat their homes with coal! Eeek. Because I also have asthma, I went to my allergist and got a new emergency inhaler and allergy meds (Singulair). 6a. I got a personal air purifier for the plane as well as for the pollution. I've never tried one, but am giving it a try! It works by producing negative ions that help repel particulates from your face. But it produces ozone, so may not work for those sensitive to ozone. A review to come later! 7. Also for the pollution, I'm bringing my one-two punch of Ocean nasal saline and Nasalcrom, which I usually use religiously during hay fever season. I use the saline first to rinse everything out, then the Nasalcrom to put a protective coating in the nose so that you don't react to the allergens in the first place. Both are over the counter at any drugstore, about $15 total for both. 8. For both the pollution and potential exposure to H1N1 (swine flu), we are also bringing disposable face masks. Asians have been doing this since SARS broke out a few years ago so it won't look THAT weird there! Plus no one will recognize us in a sea of Chinese people anyway, ha ha. 9. Just in case we do get sick while traveling, I'm packing natural cold and flu remedies Airborne and Oscillococcinum. 10. Bringing alcohol-free hand sanitizer (don't forget that all liquids in carry-on luggage need to be 4 oz. or less!) and a roll of toilet paper and baby wipes since you never can be sure of the state of toilets in developing countries. 11. Since I also have some chemical allergies (of course), I also bring along some detergent I'm familiar with to wash out undies on long trips so that I don't have to rely on strange hotel laundry detergents. Tide makes these handy little travel packs. 12. On a side note, my stress-related IBS symptoms were almost 100% conquered by my wonderful acupuncturist, Jill Harrison. The cramping, bloating, nausea and anxiety were fixed with one treatment because I certainly didn't want travel on a rigorous tour looking for a bathroom every 10 feet! I ate gingerly the next day or so and seemed to be in good shape. I tried a trigger food (red meat) and had a little trouble, but after having some papaya enzymes was feeling pretty good. For those of you with IBS, I highly recommend trying acupuncture to alleviate symptoms. It may not totally cure you, but the relief was immense and immediate -- this after having chronic symptoms for over a month! 13. I always pack a dust-mite pillow cover and put them on my pillow in every hotel. The hard part is remembering to take them off again! I'm still adding items to this list as I go along -- obviously for other humans, the list won't need to be as extensive unless you're a Queen (or King) like me. But some of these are my tried and true tips to make traveling doable, and to help cut down on allergy misery where ever you can so that you can enjoy the wonders of other parts of the world. Congrats on your adventure! Sounds like it will be really fun :) Somewhere, I had heard that dried blueberries were beneficial for settling unhappy tummies. Worth looking into that to take along on your trip. Trader Joe's has them for a reasonable price. It's so nice to know that someone else has to prepare as much as our family does when we travel. We haven't ventured out of the country yet, but it's nice to know it's possible. Have a fun trip! Let us know how the trip went! My fiance is Indonesian and I have an allergy to soy, so I'm curious as to how you managed traveling to an Asian country with a soy allergy. And I also advised a reader who was going to China, here was her story. It may be more helpful. Good luck!